Love’s will construct improvements to these I-5 ramps on the Jefferson Highway. As expected, Love’s has met the concerns of Oregon transportation officials and will get the green light to build its truck stop off I-5 when the Millersburg City Council approves a development agreement on Feb. 28. ODOT had appealed the Millersburg Planning Commission’s approval of the Love’s truck stop site plan to the city council. 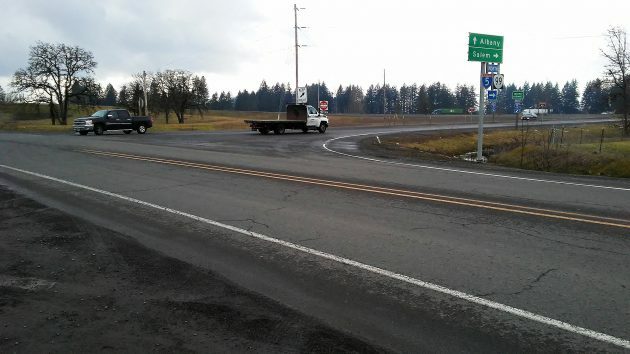 But when the council ratifies the deal, which it is expected to do next Tuesday, ODOT will withdraw its appeal and the city will be free to issue permits. The agreement between Love’s and ODOT calls on the company to construct “mitigation improvements” as required by the state traffic engineer at the intersection of the northbound I-5 ramps and Jefferson Highway. The way I read the agreement, the deal calls for adding a right-turn lane on the off-ramp from I-5 and a left-turn lane for traffic turning on to the on-ramp, plus installing “all-way” stop signs and lighting the intersection. The improvements must be completed before Millersburg grants any occupancy permits for the truck stop. The agreement doesn’t mention money, but the context says Love’s must pay for the highway work. So am I understanding that because Loves wants to build a truck stop, everyone using the HWY will be required to stop at least one stop sign that they didn’t have to before…. Wasting thousands of gallons of fuel, seems like a double win for Loves, first you make people stop and then sell them fuel because of it..
Are you speaking as an elected official of another city, or as a citizen of another city?? I am speaking as a guy who drives the road every once in a while and is wondering…. by the way centrist, where do you live??? Good Ward! Living here also it is becoming congested with autos at times but a good ward …nevertheless. Kellum does bring up an interesting accusation. That being full-bodied comments from people residing from other areas other than the mighty Albany-Millersburg area. I agree with two of these three recommendations to the northbound I-5 on-ramp — the right turn lane off the ramp and the left run lane onto the ramp. I had supported this truck stop before, and brought up this intersection as the only real concern. However, forcing all traffic to stop at all times, in both directions seems like a poor solution at that on ramp. It doesn’t mean anything I suppose, but I am against this solution. What are the mitigation plans for those that want to follow the historic route of Highway 99E without an extra stop sign? First I want to thank you for keeping us up to date on local happenings in or near Millersburg. I believe we would be a better “city of Millersburg” if we had amenities such as a grocery store in this area. Love’s is a fine outfit for trucks and travelers using I-5, but for the residents it may become inconvenient for us to use Salem Rd. due to more trucks on it. Funny how people move to an area like this then complain. There was never a grocery store out there and its always been zoned a heavy industrial area. That means truck traffic is likely. This is really commercial, not industrial, and certainly not heavy industry. If heavy industry went in (like it is zoned for), it would have some truck traffic, not only a tiny fraction compared to a truck stop. Heavy industry also tends to provide for good paying blue-collar jobs. A truck stop, not so much. Minimum wage clerks anyone? For what it’s worth, according to the project application the zoning is “limited industrial,” not heavy industrial.